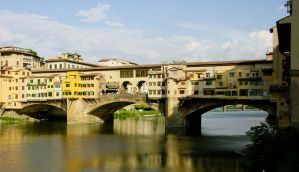 Florence is the capital of Tuscany and one of the top tourist destinations in Italy. It's a city that is filled with culture, art, and history, and visitors will not be disappointed. There are several great hostels around Florence and many offer the standard amenities including shared kitchens, ticket arrangements, and tour bookings. If you're traveling alone, hostels offer the perfect setting to meet other young travelers. Most hostels have common rooms where guests hang out and chat. Hostel Gallo d'Oro is a great value hostel located near most of Florence's top attractions. It includes all of the standards. There is a decent complimentary breakfast that's served every morning and includes juice, fruit, sandwiches, and pastries. Wi-fi and internet are also available. The hostel has a fun staff that can help you with restaurant recommendations or suggestions of fun places to hang out. There's also a travel desk that can help you book tours of the Tuscan countryside, Chianti area, and wine tasting. They also help organize walking tours of Florence, pub crawls, and museum tickets. The hostel is centrally located in the heart of Florence. It's about a five minute walk to the Accademia Gallery and ten minutes to the Duomo. It's also just twenty minutes from the train station. The hostel has dorms that sleep four or six people. There are both female only and co-ed rooms available. Academy Hostel is a small hostel with an intimate atmosphere. It's located in the heart of Florence just steps from the Duomo. It's also near the Accademia Gallery and other important sights. The hostel is a pleasant place to stay with a welcoming environment. It has a quiet but friendly setting where you can meet other guests. This is the perfect place to sit back with a book after a long day wandering around the city. It's also a top rated hostel in Europe. The rooms are well designed and comfortable. Every room has both heating and air conditioning. Private rooms are singles or twins. Dorms sleep four, five, or six people. The staff are young and friendly and they know the area well. They can help you with any suggestions of things to see and do in the surrounding area. Tasso Hostel is another popular hostel that's conveniently located in Florence. It's a little more removed from the main touristy section in Florence, but the area has the atmosphere of an authentic Italian neighborhood. It's surrounded by local homes, shops, restaurants, and wine bars. It also has an eclective vibe that embraces both local and international art and culture. They host regular weekend parties that can get quite loud, but offer a great time to meet new people and have a great time. If you're looking to head to bed early, this probably isn't the place to stay on the weekend. The hostel is comfortable with good beds and nice furnishings. There are thirteen rooms in total and each has its own unique style and feel. Both single and double rooms are available. There are also dorms that sleep two, three, or six people. The staff are friendly and helpful. They know the city well and can help with any number of things including restaurant recommendations and directions around town. WoW Florence Hostel was recently renovated in 2014. It has a relaxed environment where it's easy to hang out after a busy day exploring the city. The hostel has been decorated with vibrant and bright colors that keep the atmosphere fun and energetic. The hostel is clean and modern and the guests are diverse and international. The hostel is not far from the Duomo and it's easy to access many of the city's top attractions. Museums, theaters, restaurants, and cafes are all nearby. Guests can choose between either private rooms and dorms. Private rooms are either singles or doubles, each with it's own private bathroom. Dorms sleep four, six, or eight. Female only rooms are available. The staff here is fun and helpful. There's a great breakfast available every morning and it's easy to hang around and get to know both the staff and other travelers.